Watercolor Printable Series Flowers & Herbs | use for DIY wall art, cards, banners, screensavers & more. Free high resolution digital downloads. One of my goals for 2018 is to organize all the free printables that are available here so they are easier to access. Some are easy to find, but others have not seen the light of day for years. Links are spread out and I think it would be beneficial to all of us to have a little more order. I’ve started with this Watercolor Printable Series Flowers & Herbs. There are 15 high resolution watercolor images that can be used for a variety of DIY projects. I also included two bonus printables not pictured in the image below. 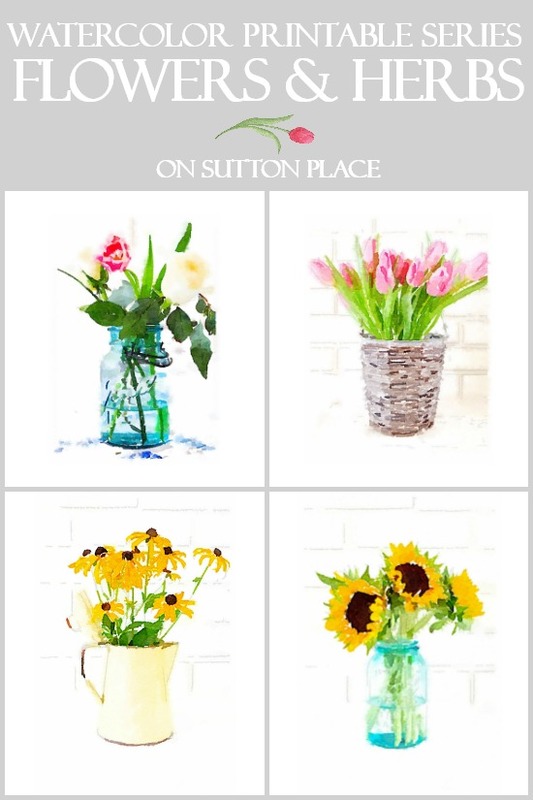 This series begain back in 2014 with the fall-inspired printables of the mums, sunflowers, and black-eyed susans. The tulips came the following spring and then the series took off from there. Every single printable image is 100% original and cannot be found anyplace else. I style the arrangments, take the photographs and then digitally transform them into watercolors. One of my favorite parts of styling the arrangments is deciding what sort of vessel to use. I’m sure you can tell that mason jars are a favorite of mine, so I hope that you love them too. All 17 images can be downloaded from one PDF file. This file is available in the OSP Members Only Library, which is an exclusive collection of printables available to my email subscribers only. This artwork can be easily sized when you click to print. Just choose 5 x 7, 8 x 10, etc. One option which I love is to print as 5 x 7’s, use 11 x 14 frames with a mat that has a 5 x 7 opening. If you didn’t want to use a mat, you could print them as an 8.5 x 11 and they would fit nicely into an 8 x 10 frame. An 8.5 x 11 diy fall watercolor printable would also fit beautifully into an 11 x 14 frame with an 8.5 x 11 mat, which is the option shown above. Select “print” from the File command on the top menu bar or click the printer icon. Under “Page Sizing” I recommend selecting the FIT option. For DIY wall art, I recommend printing on high quality cardstock. Love your content and your art! Thanks so much for sharing! Thank you much for your lovely printables. Wish you could add a section associated with stationery. Hello! Do you mean printable stationery pages? I think it’s a great idea…could you give me more details? Thank you! I love your blog and have used many of your designs over the years. I do have a question for you though, what is the name of the paint you used on your front door? I love that blue. This watercolor series is simply lovely. Thank you for sharing!! Love your site and look forward to more posts! Thank you!! Your prints are simply amazing! Our home burned completely to the ground in December and my husband and I are now living in a 350 sq. ft. apartment with thrifted, mismatched furniture. Your artwork is just what we need! Rays of sunshine and joy on the walls! Thank you so much for your generosity! It is amazing how a simple piece of beautiful art can uplift a home and a day! Kathleen…I am so sorry. One of my best friends had her home burn last summer. She is still not back in but is handling it well. She’s very patient! I know how difficult it is…hang in there! What a great idea to organize all of your printables! I love your pics. I’m planning of using about 16 of them for a large blank wall in our den. I love this set of printables! Watercolor is my favorite medium and these are just my style. I’m curious and kind of confused about the process you use and wonder if you might elaborate. Did you paint the originals? If not, who is the artist? Are the original paintings for sale? Your blog is one I continue to enjoy. Thank you for sharing your life, home and talents with us all. The watercolor printables are so so pretty!! What do I think?!?! I think I wish I had enough wall or tabletop space to display each one of your beautiful printable in my home! I have so many of them from you that I switch out from season to season or simply rotate to have something beautiful and different to look at all of the time. I regularly receive compliments on the art in my home, thanks to your wonderful generosity! Thank you dear Ann! Love these soft watercolors to start the spring off! The ideas are flowing. The printables are beautiful!!! Thanks, as always, for sharing your beautiful work. 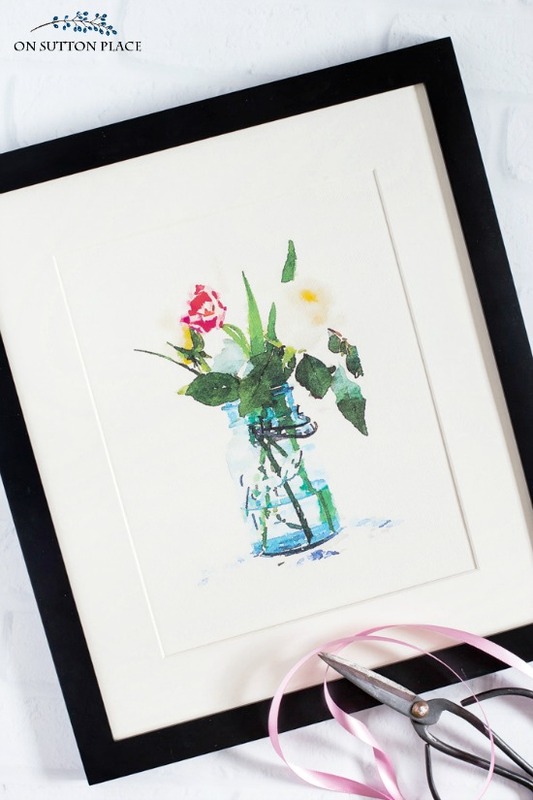 I love the new watercolor printable! It is so beautiful and you are so talented! Thank you! These are beautiful, Ann. Thank you for creating and sharing them! These are so beautiful. Thank you for sharing them! Please send printables. Thank You. The printable collection is for my email subscribers. You can join us by filling out the form in this post. Thank you!